Our main product focus is the Synology and the ioSafe Network Attached Storage (NAS) device, there are multiple models available. Right Next To You stays on the cutting edge of technology we research and test every make and model we offer. We recommend specific NAS’s based on our clients’ needs. When it comes to reliability, we border on obsessive. We extensively test every component in the product line. We track and monitor trends in reliability rates and will not add or sell any products that we can’t stand behind. What you end up with is the most reliable NAS to secure, manage and protect your data. Whether you own a small business or a large corporation Right Next To You has mult-level NAS server made precisely for your business size and unique needs. We give you control with simplicity and manageability, powerful, yet affordable Network Attached Storage emphasizing scalability and reliability. With a wide range of solutions offering reliable back-up protection and data consolidation with reliable managed network and cloud connectivity Right Next To You is the resource to have for your peace of mind. The best of the cloud, but under your control. Privacy, security and availability the Synology NAS allows you to share files easily and safely access files from anywhere, centralize file access, organize files across teams and share files on the go. Incremental and real-time backup automated data protection cross-platform compatibility, photo, video and music management even video surveillance to help keep an eye on things. Want to know more? 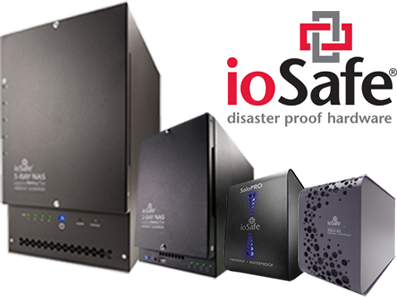 The ioSAfe product family of disaster proof hardware provides protects against data loss in fire up to 1550ºF, 1/2 hour Per ASTM E119 and Protects data from flood, full submersion, 10’ depth, 72 hours, fresh or salt water along with a built in Kensington security slot. Optional floor mount / padlock kit. Hide anywhere in the building on the local network. Want to know more? With all of this new powerful versatile technology you didn’t think we would leave you stranded did you? No way! Our NAS support managers are here to assist you every step of the way as well as complete management of your system. From day one we will setup install and maintain every aspect beginning with data migration, user accounts and rights to access the NAS. Data access file backup and replication. System and application, update and management can be performed remotely. As your business needs grow we will make sure your server continue to fit your needs in most cases without costly upgrades and or additional equipment. If the need should arise to expand you equipment that to will be seamless sand cost effective. Want to know more? Unexpected data loss from viruses, ransomware, disgruntled employee, theft and hardware failures can pose potential threats to your critical data, especially when no reliable solution to save and or recover it is available. 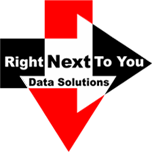 Right Next To You provides an intuitive and integrated backup and restoration solution to help you retain and retrieve your precious data. No matter when it occurs data loss can be devastating even worst is when the data loss is caused by an even more devastating event like a natural disaster like a flood, fire or earthquake, Right Next To You has the solution for you. To protect your business from disaster, Right Next To You recovery planners identify all threats, vulnerabilities, critical business processes and components of a business. This is typically called risk assessment. Risk is how likely a given threat actually could occur, and the resulting impact that adverse event would have on your business. Risk management is closely related to disaster recovery because they both deal with the prevention of risk. In fact, both disaster recovery planning and risk management are done in parallel before a disaster occurs. After an initial risk assessment, risk assessment should be conducted annually or when major infrastructure changes occur. Every file on your computer, phone or tablet is part of a complex, hierarchical system made up of directories and subdirectories. The process of naming, storing, and retrieving this data in an organized way is the basis of data management and when done efficiently, can save a tremendous amount of time and money. 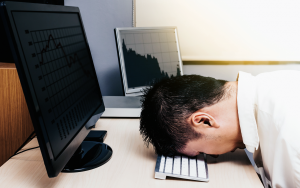 Unexpected data loss from system or drive failure, virus and ransomware, fire or natural disasters are potential threats to your data, especially when no reliable backup solution is available. Right Next To You provides an intuitive and integrated backup/restoration solution to help you retain/retrieve copies of your data and restore from a point in time. One of the most fundamental concepts of data management is the distinction between Primary and Backup. 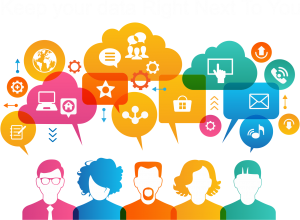 At Right Next To You we focus on restoring the data critical to supporting business functions. If you don’t have a disaster recovery strategy yet, we can help you create your own plan for the systems. Our disaster recovery specialists can review your environment and propose a mix of resiliency tools that can help you achieve your recovery targets all within your budget. The best way to avoid downtime is to eliminate points of failure in your environment. As you add redundancy, your ability to recover quickly improves and your costs decrease. We understand that the preparation for disaster recovery can be time consuming, so we can offer you an experienced team that can help you choose the right solutions for you and ensure they’re optimized to meet your recovery objectives and budget. Our disaster recovery team can help call us now. Want to know more? Our years of experience enable us to take straightforward approach to solving our clients’ most complex network challenges. Right Next To You Support Team work hand-in-hand with clients to improve network performance, maximize IT investment value, and create competitive advantage. We offer a wide range of expertise, including enterprise network design, business application outsourcing, and technology integration. We are determined to make our clients’ businesses run better in the most practical, sensible ways possible. We bring unique ideas and solutions to our clients’ business issues we believe that by treating every clients challenge as unique, we increase the possibility of discovering ways of making their businesses run better. Cloud Backup Services does not require administrative management each user has complete control over their data no need to wait for someone for IT to retrieve a deleted or corrupt file or call Right Next To You for help it is easy to understand which makes it easy to use. But as always if there is a problem that a user feels uncomfortable attempting Right Next To You technical support will always be available. Want to know more?